so often, they just seem really dull to me? Simply a character picture stuck on to the front of a regular old clock does not cut the mustard! I would like to see some wall clocks are a bit more individual and special for children’s rooms. Wouldn’t you agree? So often, the clocks I see in the shops are just plain boring and not very imaginative at all. I did some research to seek out what was available online to see what was available there! 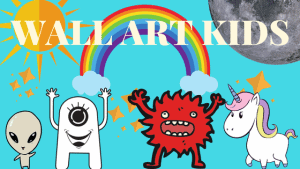 Below you’ll find a selection of kids wall clocks that I found particularly appealing and many of them also have different varieties, various shapes, colours or characters – so, be sure to check their links. I hope you like them! 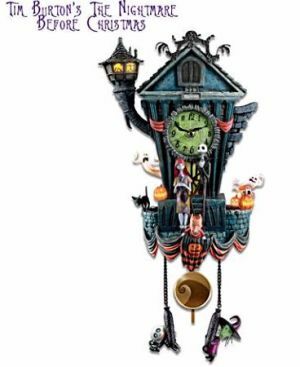 This “Nightmare Before Christmas” wall clock is so incredibly detailed! Hand crafted and intricate, it is 53cm high and has the added features of movement, lights and sound. The windows of Jacks tower, the pumpkins and ghosts light up with a flick of a switch. It is also a cuckoo clock and Zero jumps in and out of the doors of the town hall at the top of the clock at each hour of the day while the music from “This is Halloween” plays. As a cat lover, my children would love this one. There are 9 colours to choose from, so you can customise your clock depending on your child’s favourite colour. You can also choose the colours of the numbers – between black, white, red or silver. This is a handmade item, painted with acrylic and available for worldwide shipping from England. It measures 178mm x 260mm x 3mm. 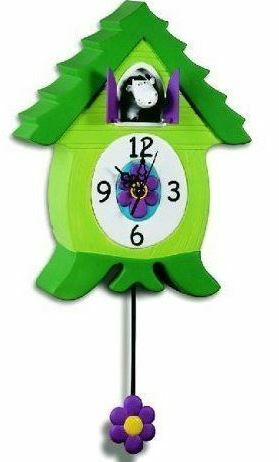 Plus, if your child has a problem with ticking clocks, this one has a sweeping motion and so does not have that ticking noise! 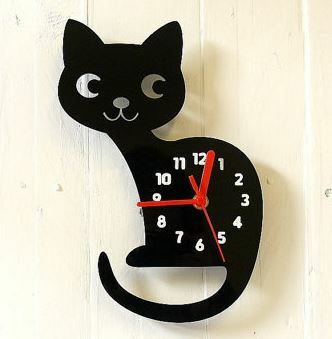 I adore this handmade clock and this seller has a variety of distinct others to choose from, all delightful. 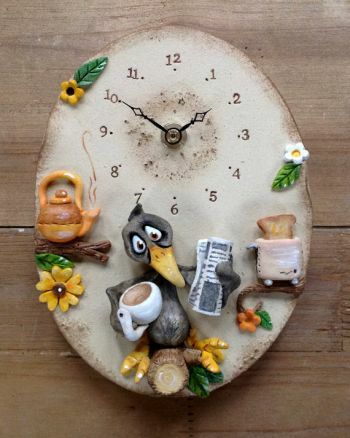 Made from ceramic and with superb reviews, this clock is truly unique and has so much character! The little blackbird sculpted from clay, is ready to have his breakfast – holding a mug of coffee and the toast popping out of the toaster! The dimensions are 7.5 inches x 5.5 inches x 1.5 inch depth. Shipping worldwide from England. When I was a child, I used to dream of having a cuckoo clock. Now, thankfully, there are a few great cuckoo clocks for kids on the market, that are affordable! This is a really cute animal themed one here and there are other variations available, including a pig, a chicken and more! Each hour, the character – in this case a cow – leaps out of the clock doors with a “MOOOOOOO” and the other clocks have their own related sounds. The dimensions are 12 x 4 x 9 inches and it does require batteries, in this case 3 x D and 1 x AA. Standard shipping is also FREE! 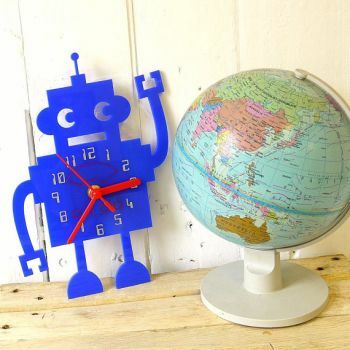 Great for a robot fan, these wall clocks are crafted from acrylic and you can customize them in different colours. There is a selection of both body, (15 colours available) and hand, (black, white, red or silver) colour. Dimensions are 230mm x 162mm x 3mm. Shipping worldwide from England, this seller also has other shaped clocks available, including a dinosaur and a hedgehog! This is such an awesome futuristic looking projection clock. 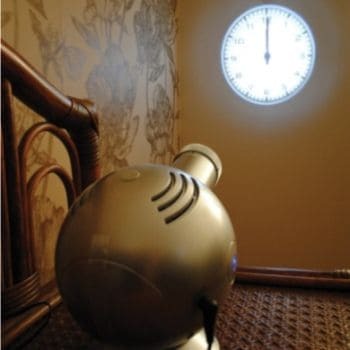 Simple to switch on and off – could work as a night light as well as a clock in your child’s room at night. The projector light comes included with some coloured slides in red, blue or yellow. So, you can change the overall mood of the room by simply changing the colour. A quirky light that could make quite a statement. Dimensions are 19cm x 13.5cm, requires one AA battery. A lovely hand painted Rocket wall clock, which you can personalise with your child’s name. This would go well in a space themed bedroom or nursery, with some space themed wall stickers! This would make an ideal gift, as it comes gift gorgeously gift wrapped with a gift tag. It needs 1 AA battery and comes with a year warranty for the clock mechanism. Shipping to within the UK. This is perhaps my most favourite of all! 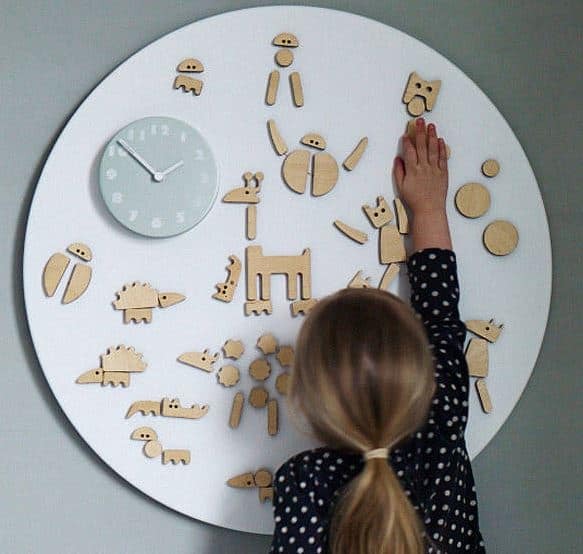 Yes, a very simple clock in the corner, but surrounding it is a large circle filled with magnetic shapes, so that your child can create an unlimited number of fun characters that will keep them entertained for hours. A fantastic edition to a bedroom, playroom, or even a kitchen! The surrounding board around the clock is magnetic, so you can attach anything you like to it, whether pictures, photos or other magnets you collect too. Dimensions – 56cm. UK delivery only. 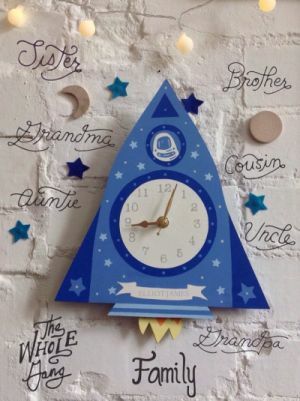 A large strap watch wall clock, that you can personalise with your child’s name. 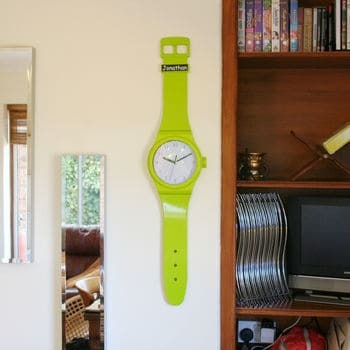 A funky clock with a choice of four colours – Green, blue, purple or pink! One AA battery is required. The dimensions are approx – H93cm x W20cm x D4.5cm. UK delivery only. 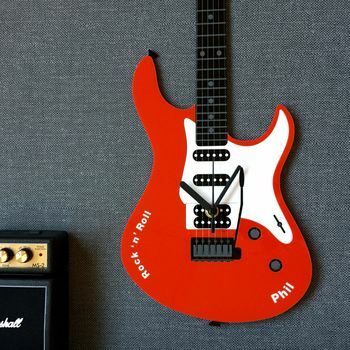 A fantastic electric guitar wall clock, this will be a unique edition to your little rock fans bedroom! You can also personalise it with their name, up to 15 characters. It’s 60cm high and 2ocm wide! There are also six different colour options available: Red, Orange, Pink, Blue, Black or Purple. There is some super detailing on this clock, even the strings are engraved. International delivery is available. That concludes my post on unique kids wall clocks…. Which do you like best? Is there any specific style you were looking for? Please, leave me a comment and let me know! Posts you may also find useful…. Hi, I love the magnetic play clock. I’ve never seen something like that, what a great, creative idea for kids! I love the design too, white, grey and wood, that’s my style! Shame it’s so expensive, do you know of any cheaper alternatives?